*At checkout you will see an additional $1 added to your total. This $1 is a charity contribution of the artist's choice. Legendary artist Graham Nash is a two-time Rock and Roll Hall of Fame inductee - with Crosby, Stills, and Nash (CSN) and with the Hollies. The Grammy Award-winner was also inducted twice into the Songwriters Hall of Fame, as a solo artist and with CSN. Towering above virtually everything that Graham Nash has accomplished in his first seventy-five years on this planet, stands the litany of songs that he has written and introduced to the soundtrack of the past half-century. His remarkable body of work, beginning with his contributions to the Hollies’ opus from 1964 to ’68—including “Stop Stop Stop,” “Pay You Back With Interest,” “On A Carousel,” “Carrie Anne,” “King Midas In Reverse,” and “Jennifer Eccles”—continues all the way to This Path Tonight (2016), his most recent solo album. The original classic union of CSN (& Young) lasted but twenty months. Yet their songs are lightning rods embedded in our DNA, starting with Nash’s “Marrakesh Express,” “Pre-Road Downs” (written for then-girlfriend Joni Mitchell), and “Lady of the Island,” from the first Crosby, Stills & Nash LP (1969). On CSNY’s Déjà Vu (1970), Nash’s “Teach Your Children” and “Our House” beseeched us to hold love tightly, to fend off the madness that was on its way. This is a rare opportunity to see one of the musical lightning rods of an era, whose work continues to electrify the world, perform at the Avalon! 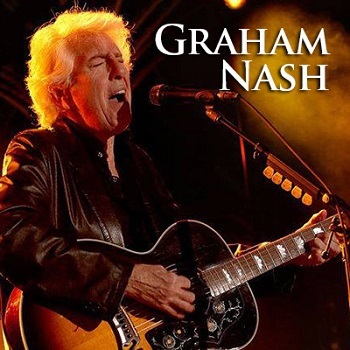 Thank you for purchasing a Graham Nash Ticket Package. You will be required to sign a waiver & release of liability. Package details subject to change without notice. All VIP packages are NON-TRANSFERABLE; NO NAME CHANGES will be permitted under any circumstances; NO REFUNDS or EXCHANGES; all sales are final. This package is for Graham Nash only. Package inclusions are as stated; no other artist interaction will occur with this package. You will receive an email from On The List Presents (VIP@OTLPresents.com) 2-3 days prior to the performance date with check-in/pick up instructions (be sure to check spam/junk email in case it lands there). For packages including soundcheck, you may be required to arrive up to several hours prior to the show. Exclusive VIP merchandise items will distributed at the venue, on the day of show ONLY. You must proceed to the designated check-in at the scheduled time to receive your package merchandise. Please note that tickets included in packages are to be picked up at the check-in location, on the day of show ONLY. To redeem all elements of your order you must present your receipt and picture ID at the check-in location. If you have questions regarding the VIP packages, or have not received your instructions in the time frame indicated, please contact On the List Presents by emailing vip@otlpresents.com. If you have ACCESSIBLE needs: please email On The List Presents customer service after you have placed your order, and we will do our best to accommodate your needs based on venue availability.